Editor’s note: Noah Lichtenstein is an entrepreneur and partner at Cowboy Ventures, a seed-stage fund that backs entrepreneurs reinventing work and personal life through software. With over a million apps each in the Apple App Store and the Google Play Store, there’s an app — or 10 — for practically everything a consumer needs. So why is it in an ever-growing sea of competing apps, some take off like rocket ships while most fade into obscurity? The answer is magic. Magic — much like unicorns — may not be real per se, but we use it to describe that intangible feeling of delight we get from our favorite apps when they ‘automagically’ just work. I push a button, and presto! my ride appears. I snap a goofy picture and shazam! my friends get a good laugh before it disappears into the ether. I swipe right on a photo of a cute, smart girl, and abracadabra! I’m chatting with someone who also swiped right. This is what consumer apps feel like when they work. 1. 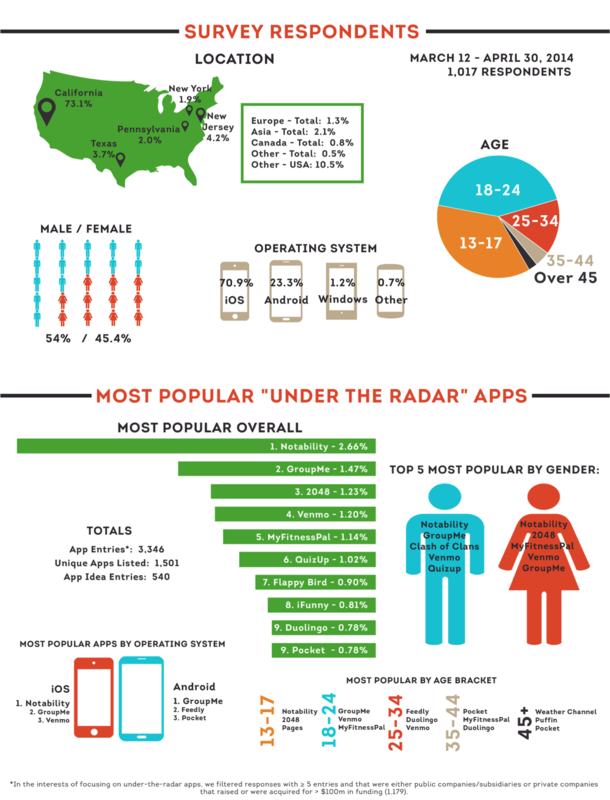 What apps are growing in popularity but currently “under the radar”? 2. What are the most wished-for apps that don’t yet seem to exist? Sadly, our survey did not uncover any under-the-radar, rapidly growing magical new apps to invest in right before they hit an inflection point. Instead, we found beyond the established category leaders, students seem to be using a sea of disparate apps. In fact, of over 3,300 app responses collected, 1,500 unique apps were represented — and no lesser-known app was said to be used frequently by more than 2.7 percent of respondents. There are likely several factors behind this. First, many of the early mobile magic-makers — like Facebook, Instagram, Snapchat, Spotify and WhatsApp — now take up a big chunk of consumers’ active daily hours. A second reason is that with the declining cost of app development, it is now cheaper than ever to build new apps tailored to serve a particular function. This has created a massive long-tail of apps to serve practically any consumer need. And for those apps that have succeeded in delighting users on one platform, many then struggle to translate the experience cross-platform, such as from desktop to mobile phones and tablets. While we didn’t discover any breakout under-the-radar apps, a common wish did emerge from our survey. Context-aware everything — making existing apps smarter based on where you are, what you’re doing, how you’re feeling, etc. Recommend what to wear — based on what you own, what you wore recently, the current weather, where you’re going, how you’re feeling, etc. While there were no clear rocket ships uncovered by our survey, the most popular app listed (2.7 percent) by students was an education-focused productivity app, Notability. Notability combines note-taking, lecture recording, document annotations, sketches, worksheets and more into a unified app, and combines this functionality with collaboration and cloud storage features. So in some ways, Notability delivers what our respondents were requesting: an app that combines multiple features into one app to deliver higher productivity and more magic. The launch of the iPhone in 2007 was nothing short of magic. And combined with the commercial launch of the Android platform in 2008, it ushered in a wave of rapid app development, so there is now an app for nearly everything. But it’s time for a second wave. If the first wave was all about dedicated apps to do specific things and leverage specific mobile phone features, we think the next wave will be made of new apps that seamlessly pull together disparate information on our phones, and that use multiple capabilities of our devices to deliver new, synthesized mobile experiences that feel like magic. As early-stage investors, we are in the “searching for magic” business—and we look forward to meeting the entrepreneurs building this next wave of magical apps. Aileen Lee contributed to this report. *The original survey form can be found here and the complete results can be found here. To note, 70 percent of the responses were from California and there was a heavy Stanford influence, which likely skews the data. For further reading, you can find a list of our favorite app idea submissions here, along with some of the funnier responses. Many thanks to Daniel Liem, Rick Barber, Ryan Hoover and Wade Vaughn for their help on this project.